This was my first time using Eagle, but thanks to Sparkfun’s tutorials it was easy. Links to Eagle files are at the end of the post. 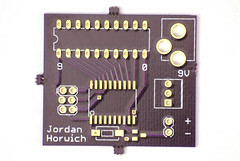 I used DorkbotPDX’s PCB service to order the boards. The price was amazing, only $10.85 (that includes shipping!) 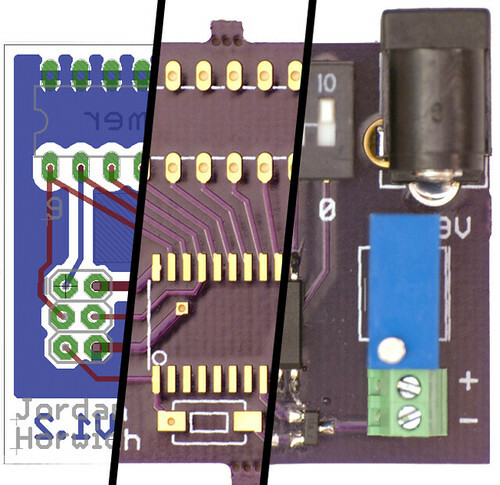 for three double-sided 1.6″x1.4″ PCBs. uint16_t initialDelay = 0xffff; //initial delay before LED turns on. Used for convenience. 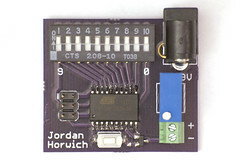 The 10 position DIP switch is used to input the desired LED on-time in binary. Each position represents a bit with bit-0 on the far right closest to the power jack. The current is set from 1mA to 500mA by adjusting the trimpot. 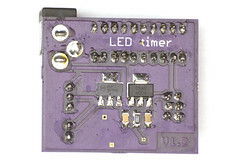 As the code only reads the DIP switch once when the ATTiny first powers on, DIP switch is changed and then the reset button is pressed to change the time interval. This becomes very tedious if you need to cycle through all 1024 values. The code could be rewritten so that the time interval value is stored in the EEPROM and is automatically incremented after every reset. 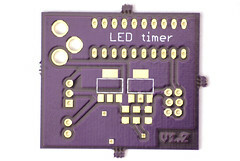 The ATTiny’s clocks and counters are set such that the shortest time interval is 0.004096 seconds, and the longest time interval is 4.194304 seconds (0.004096 * 1024). The first interval tested in the video is 1111111111, or about 4.19 seconds. The next is 01111111 (~2.10 seconds), then 0011111111 (~1.05 seconds), then 0001111111 (~0.52 seconds), and I think you can figure out the rest. 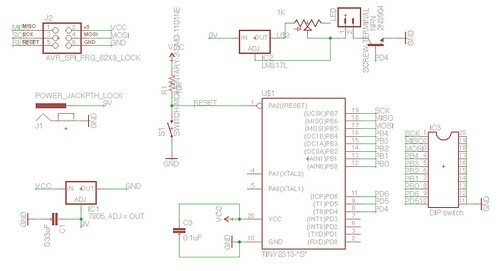 This entry was posted in AVR, LED and tagged Eagle, PCB. Bookmark the permalink.